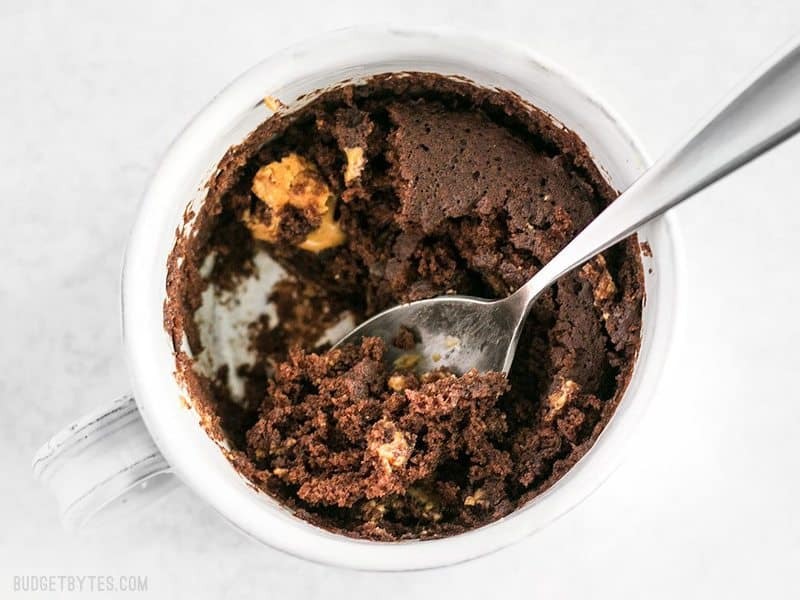 There comes a time in every girl’s life when she needs a chocolate mug cake. Perhaps it’s one of those days where you just want to curl up on the couch all day and watch bad Lifetime movies about stolen babies (ladies, you know what I’m talking about). Or maybe you just ran four miles for the first time in your entire life and unless you counteract it immediately with a dessert, the universe will be thrown out of balance and implode, and the entire 2012 apocalypse will be all your fault. Or maybe it’s your birthday and everyone forgot so there was no cake. Okay, sorry, that last one was kind of depressing. Anyway, my point is, sometimes you just need a bite of cake to make things right. Just a bite. Want more desserts? Check out our Dessert Recipe Archives! It’s small. Other recipes I’ve tried have just been too big and they make me feel like I just over indulged. This one is just a few, rich, delightful bites. There is no egg. I find that eggs make mug cakes rubbery or spongey and they also mean that you can’t scale the recipe in size. If you want a small cake, you can’t just split an egg in half, right? There are a lot of variations. 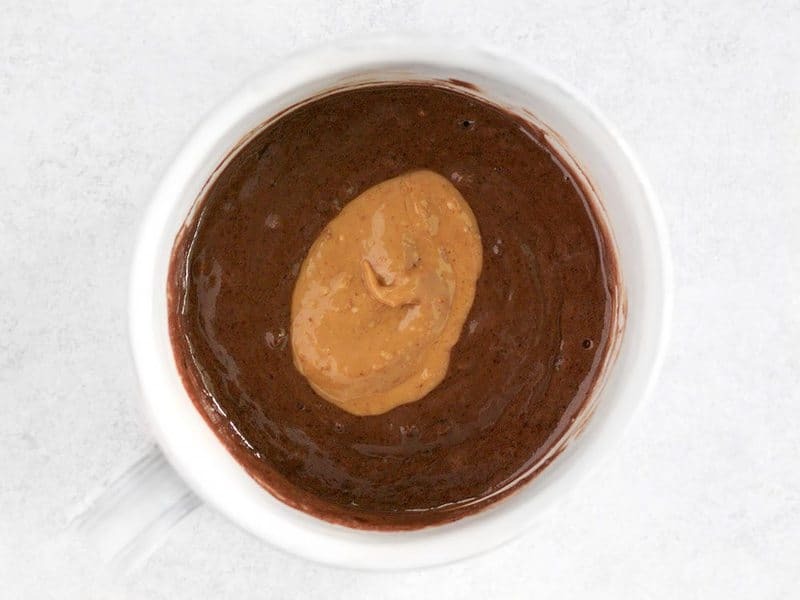 Add chocolate chips, use nutella, jam, or caramel sauce in place of the peanut butter, vegan-ize it by using soy milk in place of cow’s milk… lots of options. Don’t be tempted to leave out the peanut butter (or jam, or whatever you drop in the center) because it helps keep the cake moist and rich. It simply wouldn’t be the same without it. So, shout out to Jessie at Made From Scratch for experimenting with mug cakes until finding this perfect mix. You just saved the universe from imploding! 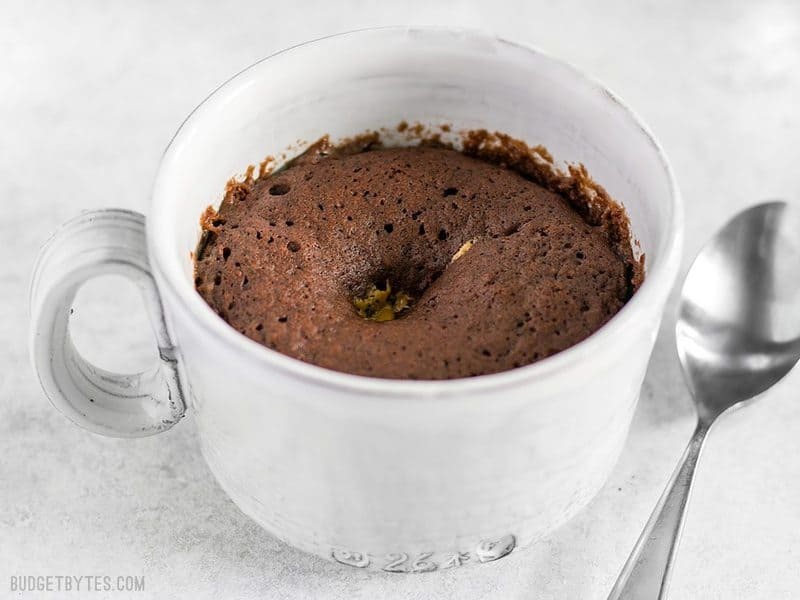 In just two minutes you can have this perfect single serving chocolate mug cake to quiet that sweet tooth. 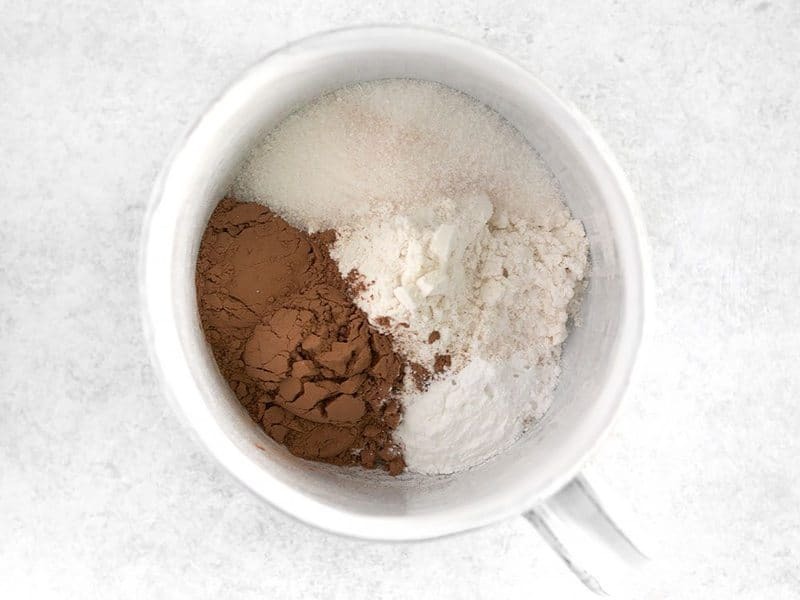 In your mug, stir together the dry ingredients (flour, cocoa powder, sugar, baking powder, and a pinch of salt). Make sure there are no clumps. Stir in the vegetable oil and milk until the mixture is smooth. 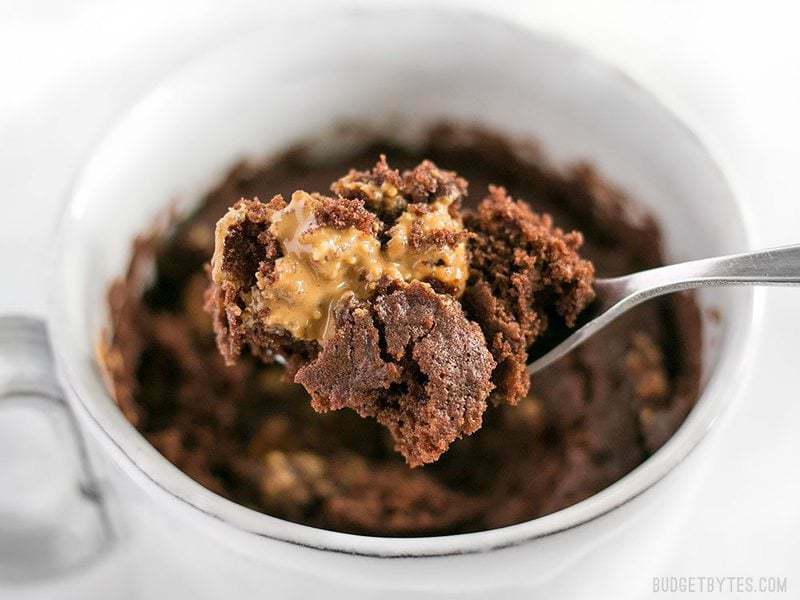 Drop a tablespoon of peanut butter into the center and push it down into the batter. Microwave on high for one minute and then enjoy! Microwave power varies slightly, so you may want to experiment with the cooking time, give or take 5-10 seconds. One minute is a good place to start. 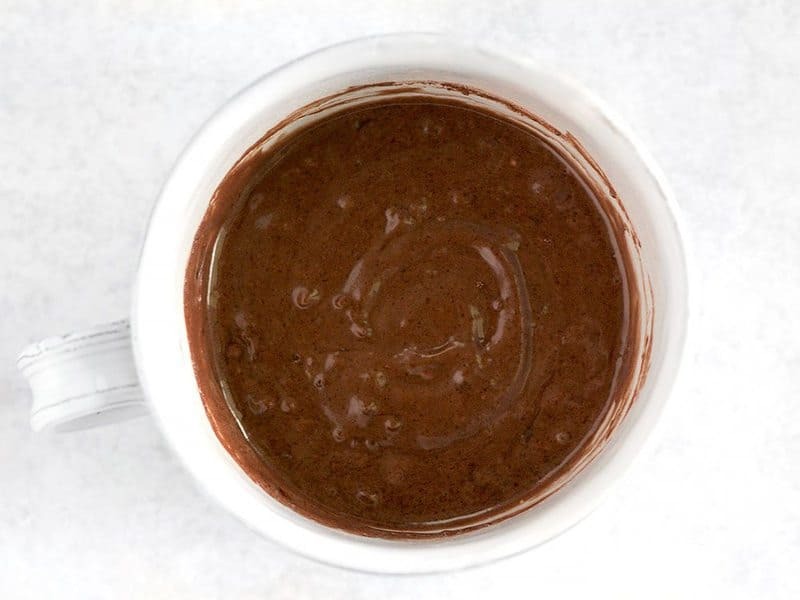 Add 2 Tbsp flour, 1 Tbs unsweetened cocoa powder, 2 tsp sugar, 1/4 tsp baking powder, and a pinch of salt to a microwave safe mug. Stir them together very well. Add 2 Tbsp milk and 1 Tbsp oil, then stir until it forms a batter. Drop a dollop of peanut butter (about 1 Tbsp) down into the center of the batter. 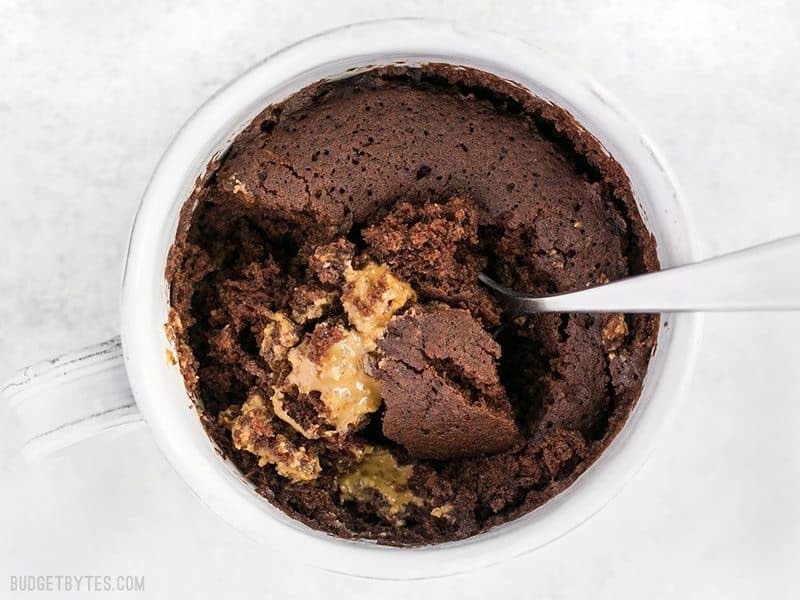 Microwave on high for one minute and you’ve got yourself a cake with a melty, peanut butter center! 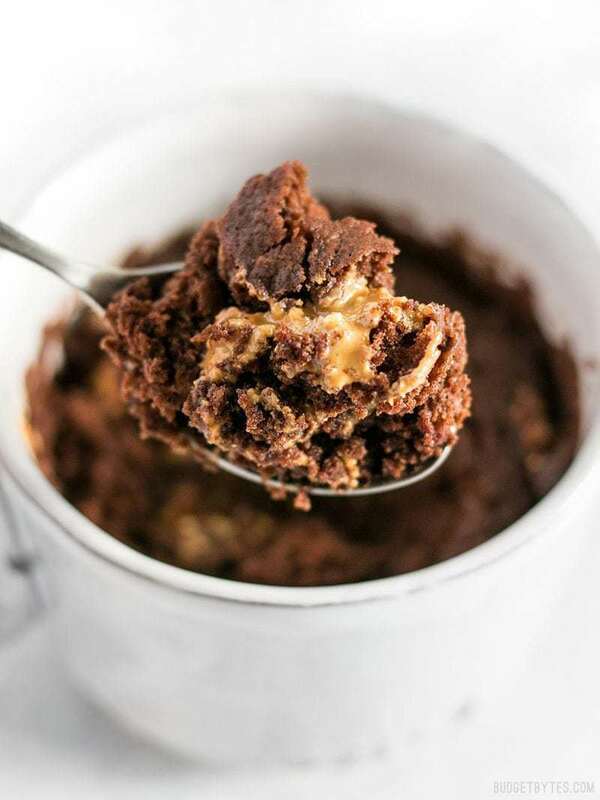 The cake turns out extra light and fluffy and the peanut butter kind of sinks in as the cake rises up around it. So magical! 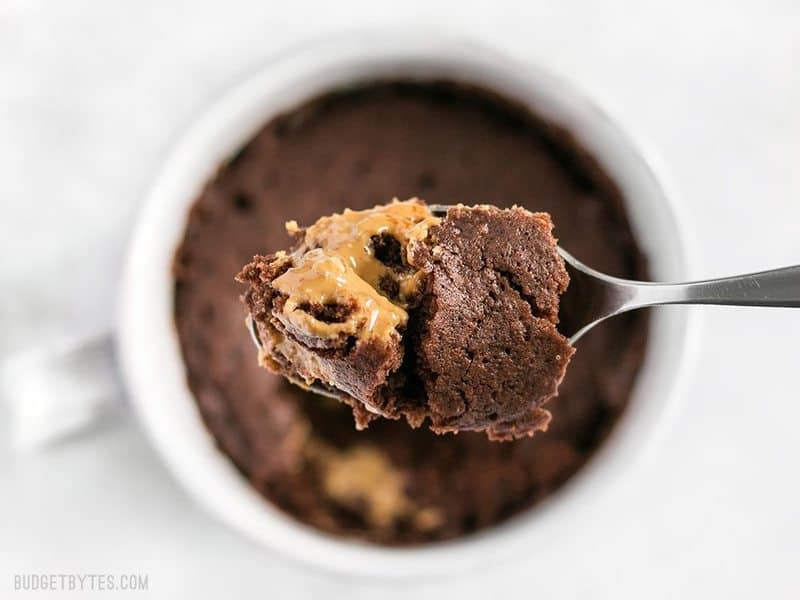 Every bite has the light cake and a gooey, rich bit of melty peanut butter. Absolutely perfect. The cake came out absolutely perfect! I enjoyed every bite. I microwaved mine for 1minute and 10seconds. My fiance couldn’t eat his because he was full after dinner,so i ate his too,lol! I drizzled some chocolate frosting on top. Just amazing! I made this tonight…doubled it. However, I didn’t have any cocoa powder. Instead I used two packets of hot chocolate mix….chocolate milk instead of regular….added a little vanilla and extra hersheys syrup. Left out the peanut butter. It turned out really well. THIS IS TRULY “THE ONE” GREAT JOB!